From the award-winning author of "Five Flavors of Dumb" comes a novel featuring one crazy road trip full of rejection, redemption, and romance. Perfect for fans of John Green's "An Abundance of Katherines," or Sara Zarr's "Once Was Lost." Sixteen-year-old Luke's self-help book "Hallelujah "has become a national bestseller and his publisher is sending him on a cross-country book tour along the historic Route 66. Unfortunately for Luke, his irresponsible older brother Matt is coming along as chauffeur. When Matt offers to drive Luke's ex-crush, Fran, across the country too, things really get crazy. In this journey of self-discovery, Luke has to loosen up and discover what it truly means to have faith to win the girl he loves. "A highly readable balance of humor, heart, self-discovery, and shenanigans." "BCCB"
"Christian values are conveyed with humor, devoid of potentially preachy pitfalls." "School Library Journal"
Antony John won the Schneider Family Book Award for his novel "Five Flavors of Dumb." As a choirboy in England, he got to hear a whole lot of confusing theological discussions. 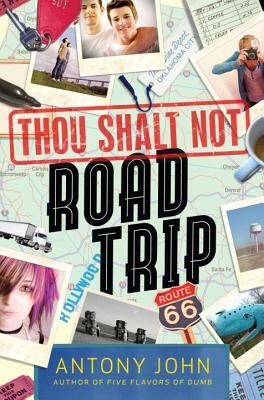 Throw in a spiritual connection with Route 66, and you get "Thou Shalt Not Road Trip." He lives with his family in St. Louis, Missouri. "A highly readable balance of humor, heart, self-discovery, and shenanigans." "Christian values are conveyed with humor, devoid of potentially preachy pitfalls." "Features multifaceted teens whose faith is integrated with their thinking but doesn't define them completely . . . [A]n upbeat read with a unique premise, great settings, and just a little more."